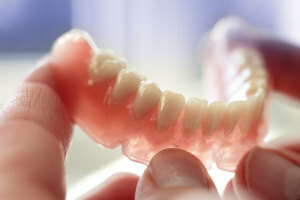 Dentures are often a sub-optimal tooth restoration solution for people as many find them uncomfortable or ill-fitting. Typically, they require a lot of upkeep just to stay in stable and need adhesive products that can be both messy and annoying. Dentures also may slip and slide while in the mouth or cause clicking or popping noises. Not only that, they can affect what you eat by not allowing you to enjoy steak, corn on the cob, or apples. Another big problem with dentures is that they sit on top of the gums, providing no added support to your jawbone to keep it from deteriorating. If you wear dentures and you’re not happy with them, the staff at Tribeca’s cosmetic dentistry office provides several replacement options for you to choose from. They are permanent and feel secure and stable. They do not cover the roof of your mouth, affecting the way you talk or the taste of food. The artificial teeth look beautiful and natural. The underlying implants keep the jawbone stimulated and prevent it from deteriorating. You will have your natural biting and chewing abilities restored. Many of our patients feel a greater sense of confidence in social and professional situations as they no longer have to worry about their dentures.